Description: Standing twenty-one feet high, this monument is an obelisk of Tennessee marble erected by Captain A. B. Thrash, commander of Company 1, 25th Regiment of North Carolina Volunteers. Thrash had the monument erected to the memory of the Confederate company he commanded and of those who lie buried in the cemetery near the monument. The names of those who joined up with Company 1 were inscribed on the monument. 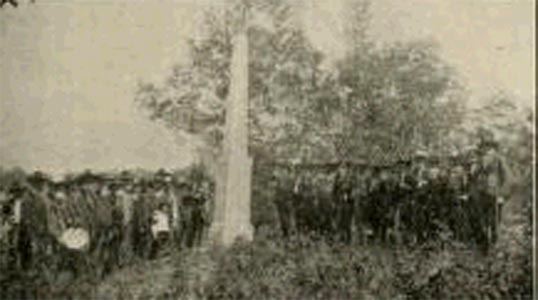 According to the 1907 volume of the Confederate Veteran, the image above includes survivors from Company 1. Subject notes: This monument is reportedly Buncombe County's first Confederate Monument. At the time of the 1907 and 1909 articles in the Confederate Veteran, the monument was reported to be located in the center of the cemetery of a small brick church, the M. E. Church South, located on a hill near town. Location: The monument is located in the cemetery on a hilltop near the unincorporated town of Candler. Additional references and revised entries have been added to the Commlands page for this monument. The new information includes the dedication date and that the Confederate monument at Newton Academy in Asheville was dedicated prior to this one. Thus it would be the oldest in Buncombe County by about a month.